Embark on the adventure of a lifetime with breathtaking views of the Hoover Dam Bridge, drive Razors through Lake Mead National Park to the Colorado River, and fly over the Mojave Desert and Grand Canyon. This thrilling excursion lets you take in the picturesque views of natures true wonders. Your voyage begins with pick up from your Las Vegas hotel in a luxury shuttle by one of our master tour guides. Your private tour guide will provide an abundance of information about the unique history of the Hoover Dam, Las Vegas, and Grand Canyon. 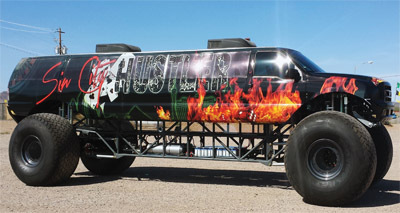 Your journey will continue through Lake Mead National Park to the Colorado River on our one of a kind Scenic Motorized Razor Tour. Ride 22 miles round trip down the natural forming trails of the national park and marvel in the rock formations that surround the trails for a total of 3 hours of total riding time. At the halfway point you will arrive at the Colorado River for a photo opportunity and chance to swim in the river during the Summer months. 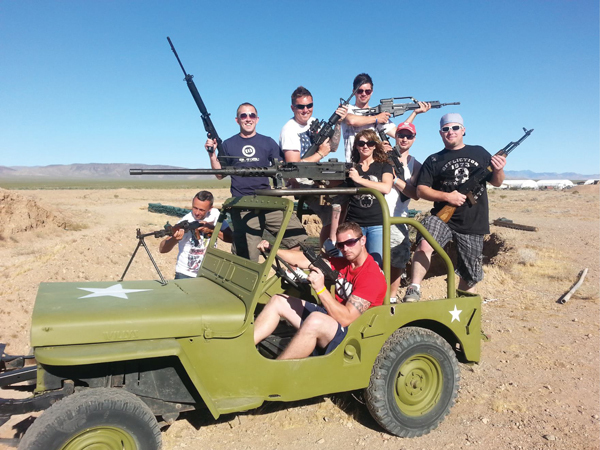 After your Dune Buggy Tour get ready to fire full automatic at our outdoor machine gun adventure. You are greeted by your tour guide and weapons specialist. Our range is superior to all other Las Vegas ranges with our unique ‘Desert Storm’ atmosphere and military style bunkers. Fire a wide variety of full automatic weapons and .50 caliber weapons including the Barrett Sniper Rifle, M2 BMG, and Desert Eagle. After the ultimate adrenaline rush, arrive at our private helicopter pad located just outside the Grand Canyon West. You will board our unique Doors Off Helicopter made especially for sightseeing and take off for the journey of a lifetime. This is the only Doors Off Grand Canyon Helicopter adventure offered in Las Vegas. Fly and feel the wind in your face for 60 minutes while you observe the local wildlife from a birds eye view. On the way to the Grand Canyon fly 300 feet over the Largest Joshua Tree Forest in the World dated at over 200 years old. View an abandoned copper mine from the 1800’s, a natural desert spring, and the Grand Wash Cliffs. Upon arrival soar above the Grand Canyon with panoramic 180 degree views of the magnificent scenery below. Marvel the towering cliffs and stunning multi-colored walls laced with crimson, orange, purple, and black sculpted over 100 million years. You will then descend 1,500 feet below the rim of the canyon and feel the thrilling sensation in it’s enormity. Sit back, relax, and revel in the astonishing views of this Natural Wonder of the World. Circle back and bask in the majestic aerial views of the Colorado River and Quartermaster Canyons alluring scenery. Gently touch down and relax at our onsite restaurant and bar as you enjoy our World Famous Burger, fries, and soda. After a thrilling day your tour guide will drive you back to your Las Vegas hotel with memories to last a lifetime. For the total Adrenaline Junkie, the outsides seats are for you with the fresh air blowing. For the people who don’t want the fresh air blowing on them, the two back middle seats and center front seats of the helicopter are practically wind free. Flight times are approximate and are subject to change based on weather conditions. If a flight is cancelled due to inclement weather, you will have the option to reschedule your flight or receive a full refund. Minimum number of passengers apply. A flight is subject to cancellation after confirmation if the minimum number of passengers required to fly do not meet the requirements. If the flight is cancelled for this reason you will have the option to reschedule or receive a full refund. Individual passenger body weights MUST be provided at time of booking. Due to comfort and safety on the aircraft, individuals who weigh more that 250 pounds (lbs) are REQUIRED to purchase a comfort seat. This charge will be collected by the tour operator directly on the day of the tour. Age restriction Doors Off: 2 years old. Children ages 2-17 must be accompanied by an adult at all times. Children must be 12 years old and 5 feet tall to shoot. All children under the age of 12 can participate in this adventure as a non-shooter. Children must be 16 years old to drive the Dune Buggy. All children under the age of 16 must ride as a passenger. Wheelchairs are not allowed on the aircraft. Handicapped individuals are allowed to ride in the aircraft. Assistance is provided to individuals who need help boarding the aircraft. All passengers must bring a Valid ID (Passport or Drivers License). This adventure combines a scenic tour with a thrilling helicopter flight. We recommend dressing for the occasion. In the winter months dress in layers including gloves, hats, and scarves. We recommend bringing sunglasses to keep the wind out of your eyes. We also reccomend people who have long hair to bring a hair tie. Pick up ranges between 5:00am and 7:00am depending on what hotel you are staying at. Times will vary depending on availability. Times for doors off adventure may be scheduled at times that are notlisted. In order to schedule a time that is not listed, you will have purchase all 6 seats.